Measuring the Cash Conversion Cycle in an International Supply Chain, Annual Logistics Research Network (LRN) Conference Proceedings 2005, Plymouth , UK , 7-9 September 2005, pp. 29-34, ISBN 1-904564-13-5. The Impact of Port & Trade Security Initiatives on Maritime Supply Chain Management, in: Maritime Policy & Management, Vol. 32, no. 1, 2005, pp. 1-11, ISSN 0308-8839. Assessing import channels for Lao PDR, in: Asia Pacific Journal of Marketing & Logistics, Vol. 16, no. 2, 2004, pp. 62-81, ISSN 0954-7517. Public Warehouses as a Tool for Border Trade Facilitation in the Greater Mekong Sub-region, Report done for the Greater Mekong Sub-region Business Forum, Asian Development Bank & Economic & Social Commission for Asia and the Pacific, Bangkok, February, 2004. Improving the Efficiency of Service Provisions: Trade & Logistics Facilitation, paper presented at the OECD Regional workshop on Trade capacity building and private sector development in Asia, Phnom Penh, Cambodia, 2-3 December 2003. The Impact of Port & Trade Security Initiatives on Supply Chain Management: A Regional Perspective, Paper presented at the Maritime Institute of Malaysia (MIMA) Seminar on Port & Trade Security, Kuala Lumpur, 20 August 2003. The Customs Security Initiative (CSI) and its impact on global supply chains, Paper presented at the APEC Customs-Business Dialogue (ACBD) 2003, Bangkok, 11 August 2003. 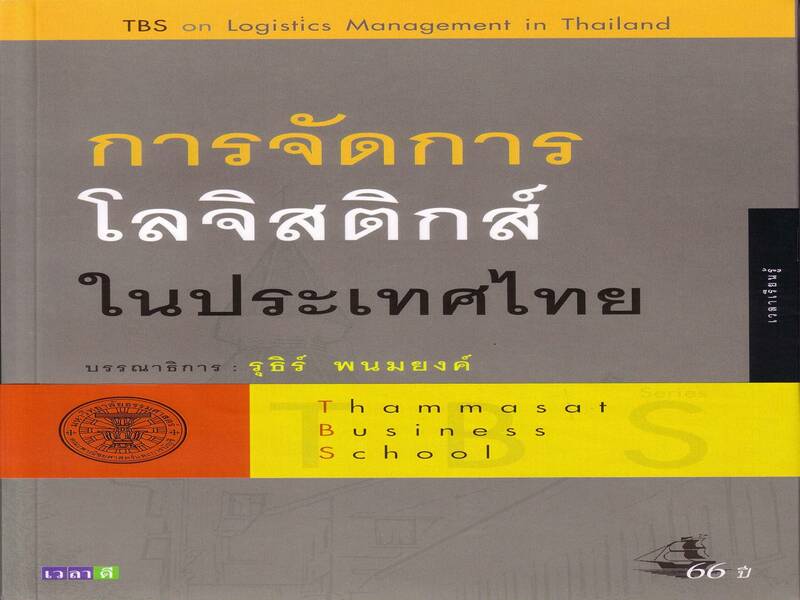 Possible Research Directions for Logistics & Supply Chain Management Strategies, Thammasat Journal of Business Administrations, special issue on supply chain challenges in Asia, 19 November 2002, pp.1 - 8, ISSN 0125-233X. Triangulation in Logistics Research, Proceedings of the Logistics Educators Conference at the Council of Logistics Management annual conference 2002, 29 September-2 October 2002, San Francisco, p. 32-33. Chapter IV: Trade and freight markets, in Review of Maritime Transport 2001, United Nations, New York and Geneva 2001, pp. 47-64, UNCTAD/RMT/2001. Chapter VII: Review of Regional Developments East Asia, in Review of Maritime Transport 2001, United Nations, New York and Geneva 2001, pp. 87-104, UNCTAD/RMT/2001. AFTA & Multimodal Transport in ASEAN: It's impact on Malaysia,Paper presented at the Maritime Institute of Malaysia (MIMA) Seminar on AFTA and Maritime Logistics, Kuala Lumpur, 12 November 2001. Shipping issues specific to Thailand, Policy paper presented at the Workshop on the Formulation of Shipping and Port Development Policy, UN-ESCAP, Bangkok, 11-12 September 2001.
on Transport Research (WCTR), Seoul, Korea, 22-27 July 2001. 13 March 2000, p. 4. Report for United Nations Economic and Social Commission for Asia and the Pacific (UN-ESCAP), Bangkok, Thailand, 1999. The Development of Freight Forwarding and Multimodal Transport in the Greater Mekong Sub-region (GMS): Summary Reports, ESCAP, Bangkok, Thailand, 1999. Current Development in Freight Forwarding, Paper presented at the Sub-regional Seminar on the Development of Freight Forwarding and Multimodal Transport, ESCAP Secretariat background paper 1, Bangkok, Thailand, 14-15 October 1999. Achieving Trade Competitiveness in the GMS with Freight Forwarding and Multimodal Transport, Paper presented at the Sub-regional Seminar on the Development of Freight Forwarding and Multimodal Transport, ESCAP Secretariat background paper 2, Bangkok, Thailand, 14-15 October 1999. NVOCC & Multimodal Transport Services, Paper presented at the Sub-regional Seminar on the Development of Freight Forwarding and Multimodal Transport, ESCAP Secretariat background paper 3, Bangkok, Thailand, 14-15 October 1999.
paper 3, Bangkok, Thailand, 14-15 October 1999. 2-4 June 1999, Monchy St. Eloi, France. in: TIFFA Freight Forwarding Handbook 1999/2000, Bangkok, Thailand, pp. 63-79. 22 January 1999, p. 10. 21 December 1998, p. 10.
International Logistics: An Introduction, in: TIFFA Handbook on Freight Forwarding 1998, Bangkok, Thailand, p. 74-76. Wakefield (Ed.) for Wilde Sapte, London. Banomyong R, Basnet C, Childerhouse P, Deakins E, Disney SM, Naim MM, Towill DR (2005) Internationalising the Quick Scan Audit Methodology, 18th International Conference on Production Research Proceedings, Salerno, Italy, July 31-August 4 2005, ISBN 88-87030-96-0. Banomyong R, Ritthironk N, Varadejsatitwong P & Veerakachen V (2005) Stakeholders’ perspective on logistics in the Greater Mekong Sub-region, Transborder Issues in the Greater Mekong Sub-region international conference proceedings, Ubon Ratchatani, Thailand, June 30-July 2, 2005. Banomyong R, Veerakachen V & Supatn N (2004) Leagility in reverse logistics process: a case study of electronic appliance manufacturer, 9th Logistics Research Network (LRN) Conference 2004, Dublin, Ireland, 8-10 September 2004, pp. 36-42, ISBN 1-904564-10-0. Banomyong R & Supatn N (2004) Comparing lean and agile logistics strategies: a case study, 2nd World Conference on Production & Operation Management Society (POMS) Proceedings, Cancun, Mexico, April 30-May 3, 2004, pp. 1-21, ISSN 1548-4882. Salam A & Banomyong R (2003) Relationship Satisfaction between P&G and its Retailers in Thailand, Proceedings of the 8th annual International Symposium on Logistics (ISL), Seville, Spain, 6-8 July 2003, pp. 253-258, ISBN 0-85358-121-5. Banomyong R, Iwata S, Kumazawa K & Banomyong R (2002) Issues in cross-border inter-city freight transport in ASEAN, Thammasat Journal of Business Administration, Special Issue on Supply Chain Challenges in Asia, 19 November 2002, pp. 59-69, ISSN 0125-233X. Banomyong R & Salam A (2002) Long-term partnering relationship in the supply chain, Proceedings of the 7th Logistics Research Network (LRN) Annual Conference 2002, Birmingham, 4-6 September 2002; pp. 371-376, ISBN: 1-870214-96-X. Banomyong R & Beresford AKC (2001) Multimodal Transport: The Case of Laotian Garment Exporters, International Journal of Physical Distribution and Logistics Management, Vol. 31, No. 9, 2001, pp. 663-685, ISSN 0960-0035.
pp. 44-52,, ISBN No. 1-870214-93-5. Nair VNP R, Gardner BM & Banomyong R (2001) Theories & Practices of Multimodal Transport in Europe, Proceedings of the 9th World Conference on Transport Research (WCTR), Seoul, Korea, 22-27 July 2001.
of the Logistics Research Network (LRN) Annual Conference 2000, Cardiff, 6-8 September 2000, pp. 45-54. Jennings E, Beresford AKC & Banomyong R (2000) Emergency Relief Logistics: A Disaster Response Model, Occasional Paper No. 64, Department of Maritime Studies and International Transport, Cardiff University, ISSN 0967-5566. Banomyong R & Beresford AKC (2000) Multimodal Transport Corridors in South East Asia: A Study of Laotian Garment Exporters, Proceedings of the Third International Meeting for Research in Logistics (IRML), Trois-Rivieres, Quebec, Canada, 9-11 May 2000. 25-29 January 2000, Copenhagen Business School, Denmark. Banomyong R, Bezy P.Y & Karandawala G (1999) Freight Forwarding and Multimodal Transport, Supplementary reading for Cambodia, Lao PDR, Myanmar, Vietnam, ESCAP Secretariat, Bangkok, Thailand. Banomyong R, Nair VNP R, Beresford AKC (1999) Managing 'Demand Amplification' in the Supply Chain: The Thai Forwarder's Experience, Occasional Paper No. 59, Department of Maritime Studies and International Transport, Cardiff University, ISSN 0967-5566. Banomyong R & Nair VNP R (1998) Managing Information Flows in the Supply Chain: A Forwarder's Perspective Paper presented at the European University Network In Logistics (EUNIL) Conference, 27-29 April 1998, Cardiff University, Wales. มองมุมใหม่ : ของขวัญจากรัฐบาล ...... สู่ บทด.